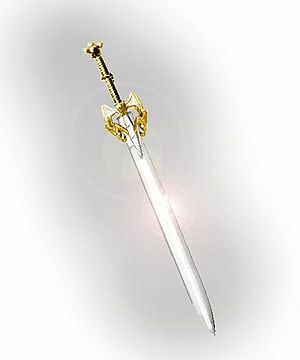 It would be hard to deny that Excalibur (or Caledfwlch or Caliburn or Calesvol or any of several other variants) is one of the most legendary magical swords in western popular culture. When you want to translate it into a game though… that’s part of the problem. There are a LOT of versions of the Arthurian tales, most with several swords (the sword in the stone generally ISN’T Excalibur). In many ways Excalibur is the counterpart to the Grail. The Grail brings healing and spiritual growth, while Excalibur brings victory and temporal power. Together… they would allow a king to rule his realm with true, enduring, wisdom. Is it any wonder that Merlin sends the quarrelsome, purposeless, knights of the round table to seek the Grail? It doesn’t help that most of the stories were – by most game standards and definitely by d20 standards – set in a very low-magic world. Merlin offered advice, and prophecy, and might have raised a few mists or healed some small wounds – but you didn’t find him hurling bolts of lightning, or teleporting, or summoning herds of mammoths to trample opposing armies. That kind of thing didn’t come up until movies and television programs started looking for visuals and ways to add extra excitement through special effects. That meant that Excalibur could be an impressive magical weapon without actually having all that much power. In the original tales, Excalibur is generally agreed to be very sharp and hard (often to the point where it readily notched or ruined normal armor and other blades and was nigh-unbreakable) and sometimes blazed brightly enough to blind opponents. In some (but by no means all) tales it also seemed to give Arthur a substantial advantage in combat – but that’s hard to say; he was supposed to be a great knight, and favored by various supernatural powers, in any case – and MOST games let high-end warrior types defeat ordinary combatants by the dozens in any case, magic sword or no. And… that’s about it. Plenty of later interpretations have assigned all kinds of powers to the blade – ranging from ill-defined “invincibility” to making the user incapable of lying – but there’s little or no agreement on such things. The most common bit of confusion – mixing up the Sword in the Stone that showed Arthur to be the destined king with Excalibur in the keeping of the Lady of the Lake – makes the blade a symbol of kingship that draws men to the user and inspires them. OK, that sounds like fun – and makes the blade something we can build on a bit. I’ll throw in that bit. Given that this IS d20, Excalibur will be needing some pretty potent combat magic built in or people will be really disappointed. After all, what king doesn’t wield at LEAST a +4 sword? Its a Masterwork Adamant Longsword, Tempered with Witchfire (+50% to normal hardness and hit points, +1 to hit and damage due to incredible quality). This has no character point cost – but, in combination with the jewels and rich ornamentation of the hilt and blade – the sword is obviously both expensive and of great quality. Major Privilege/Recognized as the Rightful King: Excalibur is the Sword of Kings and anyone who bears it will be recognized as a great lord of the land. This is Corrupted/the wielder will often find people appealing to him for aid or justice, and will find it necessary to at least make an attempt at providing it (4 CP). Major Favors with +2 Bonus Uses (Fey, Local Godlings and other Land-Spirits): Excalibur is a symbol of rulership, granting authority over both men and the spirits of the realm. Supernatural powers will often come to the aid of the bearer, for the spirits of the land also recognize their rightful lord. Corrupted/the long-term health of the land is tied to the long term health of the bearer. If he or she becomes corrupt, cursed, or crippled, that condition will be reflected in the realm (6 CP). Privilege/three spirit favors each month may be discounted as tribute, and need not be repaid, Corrupted/only as long as the bearer gives the spirits of the land due respect (2 CP). This will neatly cover modest battle blessings, the blade occasionally shining so brightly as to make it hard for opponents to see, and so on. Returning: Corrupted/while the blade is nigh-indestructible, and will inevitably (if eventually) be reforged if it is somehow broken, and the wielder will eventually return from almost any doom save willingly passing on the blade to another, either of these can require a very long time indeed (4 CP). Leadership with the Emperor’s Star modifier: Whoever bears Excalibur will draw creatures of distinction and valor to his or her service as naturally as a comet trails it’s banner of flight. Corrupted/the great and valiant are often proud and contentious; the bearer will often need to find occupation, rewards, and support for them – as well as settling their quarrels and mediating as to who is the greatest of them (8 CP). Imbuement with the Improved, Superior, and Focused modifiers: Excalibur is a mighty weapon, but it’s magical potency is limited by the strength of the possessor. It gains an effective bonus equal to (The User’s Level/2, rounded up) and allows the user to take some or all of those “pluses” as special magical abilities – although these may not be changed for any given wielder once chosen (24 CP). For fairly obvious reasons it is highly desired by usurpers, major nobles, and would-be rulers. After all, it’s power bestows legitimacy and respect upon the bearer and can provide a ruler or warlord with considerable help. The user can expect regular attempts to steal the blade. The bearer’s kingship cannot be concealed. His or her presence is never overlooked in a crowd and people will request his or her opinion on important subjects as a matter of course. The user must remain either a powerful king OR be truly noble and striving to become a king. If he or she does not fit these criteria, Excalibur will surely slip from his or her grasp. The user must invest his or her own CP in Excalibur to wield it – forging a permanent link with the powers of the otherworld. That reduces the net cost of Excalibur to 24 CP – making it a four-point relic and a major tool of rulership. If a character takes it up, he or she will become a focus of destiny – to rule, or to fail most spectacularly. Choose wisely. Legendary relics are not to be trifled with. Excalibur is hardly the only weapon associated with Arthur, nor the only sword. Welsh tradition includes a dagger named Carnwennan and a spear named Rhongomyniad. Carnwennan (“Little White-Hilt”) first appears in Culhwch and Olwen, where it is used by Arthur to slice the “Very Black Witch” in half. Rhongomyniad (“spear slayer”) is also first mentioned in Culhwch, it appears as simply Ron (“spear”) in Geoffrey’s Historia. In the Alliterative Morte Arthure there is mention of Clarent, a sword of peace meant for knighting and ceremonies as opposed to battle. Nevertheless, it’s hard to deny that – when people speak of “Arthur’s Sword” – it’s almost always some version of Excalibur that they mean. Regarding the restriction that someone needs to invest their own CPs in a relic to utilize it, I wanted to ask if this requires the person to already have Create Relic in order to do this or not. This actually is part of a broader question I had – if a person has a signature item, but wasn’t the creator of that item (and doesn’t create items at all, for that matter) how would you represent that as a relic, in Eclipse? The problem here, as I see it, is that there’s a narrative implication in the Create Relic power; that having it suggests that the character is a skilled creator of mystic items. If you want your character to have such an item, but not be the one who made it, what should you do? I’m leaning towards a specialized (or corrupted and specialized) Create Relic, since it functions as a prerequisite for just one relic, and can’t be used after that. I know that one alternative answer would be Create Artifact or Craft Item, but those are for making standard magic items, which won’t due if you want something with Eclipse-style abilities (the kind bought with CP); only Create Relic gives you that. Relics that require the user to invest their own character points don’t require that the character have “Create Relic” to do so. After all, the relic already exists. What it’s usually really saying is that you can’t just pick up a pile of relics and become invincible. They’re most common in worlds where characters are granted a limited number of “floating” points to use to bond relics – usually by taking Double Enthusiast/Specialized in Relics to allow them to use up to 4 CP worth of relics. That way each character can have their neat toy or signature item without being able to pool them. There are a variety of ways to make personalized, signature items without being a general item creator. The most popular so far is Enthusiast/Specialized in Relics and Create Relic/Specialized and Corrupted for your particular relic. The net effect is that you get to have particular relic and it can’t be taken away for long – and you can slap special effects on that as you please. After all, it doesn’t really matter whether you recreate the item (and the “original” vanishes as the points invested in it vanish) or whether you call it back somehow. Corrupt or Specialize personal abilities so as to require the item as a focus. Buy the Runebinding upgrade under Mystic Link – allowing you to enchant a specific item that’s bound to you. Ask the GM to let you simply invest a few CP in starting with a relic – whether you found it, had someone else capable of creating relics make it for you (normally using your own CP; that can be done with blessings, or rituals,or in various other ways), or creating it was simply some sort of magical accident. An appropriate privilege, contact, or favor might be in order though. For those that might be wondering, relic stats for the Sheathe of Excalibur can be found here.